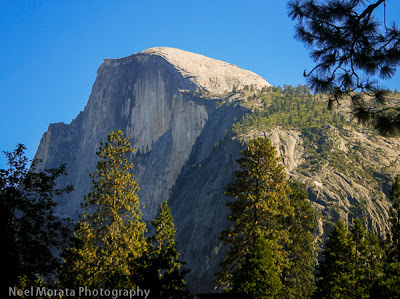 Updated 04.01.2019: Hiking through a scenic national park like Yosemite is a fantastic way to experience nature’s exquisite beauty. And, if you’ve been reading My Itchy Travel Feet for very long, you know our motto: Put your feet on the ground to truly experience a place. Between majestic mountains, clear lakes, dramatic waterfalls, and incredible views all around, Yosemite National Park really is a national treasure. If you’re planning a trip to California to explore Yosemite, guest writer, photographer Noel Morata, is here to give us some details on the best hikes in Yosemite for boomer travelers. Yosemite National Park in California is a hiking paradise for those who want to be outdoors experiencing different aspects of the park. There are a variety of trails to match any walking or hiking level or time commitment. The hikes that I’ve included in this article are some my favorites. They are also the most popular ones in the valley ranging from easy strolls to more challenging and difficult trails. 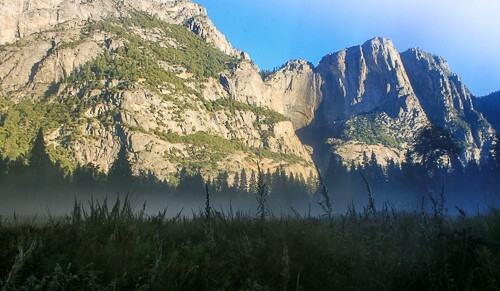 Yosemite National Park is a hiker’s dream come true. I have hiked all of the Yosemite trails included here except for Half Dome, which I have never had the opportunity to experience. 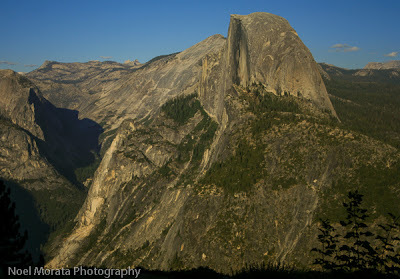 Did you know that Half Dome requires a reservation to make the climb to the top? Maybe you can try it some day and send me a picture of the amazing view? Check the Yosemite National Park website for more hiking information. One of my favorite first hikes whenever I re-visit the Yosemite Valley is Bridalveil Fall because of its close proximity to the valley entrance. This is an easy hike, 0.5 miles round-trip, and it takes about 20 minutes in a leisurely stroll from the parking lot to the base of the waterfall. Views of the falls are better from a distance compared to reaching the end of the trail. 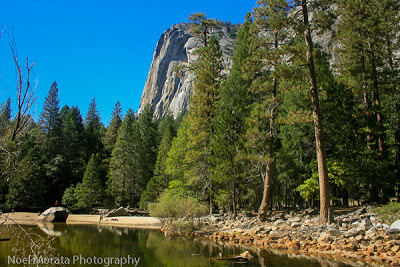 One of my favorite easy hikes on the Yosemite valley floor is Mirror lake. This flat, easy trail covers 2 miles round-trip over paved roads and dirt trails on the other side of the Merced river. There is also a 5-mile-loop around the lake which takes over two hours to complete. Views of the mountain cliffs are spectacular and also are beautiful in water reflections on the lake. This flat and paved trail is only 1 mile long and takes about 30 minutes to complete. Beautiful views of the lower and upper falls can be seen on this hike. If you visit in spring or early summer, expect to be sprayed by water when the falls are at peak volume. On a fall visit, Yosemite Falls may be almost dry. Hiking in Yosemite National Park doesn’t get any better than this moderately-strenuous trail covering 7.2 miles round-trip. The journey takes between 6 to 8 hours and you will climb to a height of 2,700 feet from the valley floor. There are many switch backs on this trail but you will be rewarded with gorgeous views of monuments and panoramas in the valley when stopping to catch your breath at many of the lookout points. Reaching Nevada Fall requires that you first hike to Vernal Fall on the Mist Trail. A more strenuous trail, this hike covers 5.4 miles and takes 5 to 6 hours with a 2,000 feet climb in elevation. 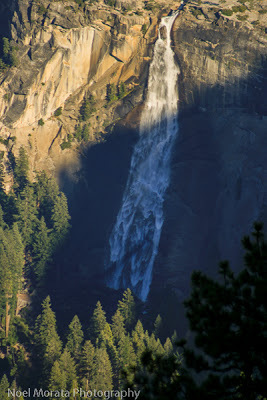 You can also hike the John Muir trail and bypass Vernal Fall. The framed views of Nevada Fall are spectacular from below or photographed from Glacier Point where the images here were taken. 4 Mile trail is one of my favorite trails in Yosemite valley because of the amount of scenic panoramas on different parts of the hike. A strenuous trail covering 9.6 miles round-trip, the journey takes 6 to 8 hours with an ascent of 3,200 feet. The views of the valley and monuments from this trail are quite spectacular and worth the effort. For an easier hiking experience, take a shuttle to or from the top of Glacier Point to hike one leg of the trail. Be sure to make reservations in advance because the buses are always full. This challenging hike covers 14 miles round-trip (via the Mist Trail) and takes 10 to 12 hours, climbing to a 4,600 feet elevation. The top portion of Half Dome is accessed by cables and requires a permit. The cables are installed after the snow pack melts in the summer and are taken down when winter weather begins to move in during the fall. Apply for permits here. Although these are some of the most popular trails for hiking in Yosemite Valley, there are many others throughout the park to fit any challenge or requirement. Which of my favorite Yosemite hikes would you like to try? For a memorable stay in historic, national park lodging, reserve a room at the Majestic Yosemite Hotel (previously known as the Ahwhanee Hotel). Or check out this list of places to stay in Yosemite National Park. A good hiking book helps you find the best trail for your hiking level. We recommend the Falcon Guide to Hiking Yosemite National Park. Save those boomer knees! Pack hiking poles. Yes, you can bring them on the plane. You’ll be arriving by car, so a copy of Benchmark California Road and Recreation Atlas is a must for exploring on the way to and from Yosemite. Planning a hiking trip? Be sure to check out our Hiking Travel Planner. Have you had the pleasure of hiking in Yosemite before? Come join the conversation at the My Itchy Travel Feet page on Facebook. Or send us an email with your thoughts. Noel Morata is a freelance photographer and writer based in Hawaii Island and in San Francisco. He also maintains a popular travel photography site called Travel Photo Discovery , which offers photo inspirations and tips, travel advice, adventure and recreational travel and some unusual discoveries. Go and visit his travel site when you have a moment.